It’s 2:57 in the afternoon, and your boss is about to put the cherry on top of a very important meeting. Suddenly, she morphs into a human-sized churro, her presentation fills with Boston cream pie charts and candy bar graphs, and the growl in your stomach sends antelope scurrying for safety. Move along, willpower. This hunger is no game. YOU NEED A SNACK! Company leaders may not be in immediate danger of being spiraled, fried and sprinkled with sugar, but employee hunger pangs can still land their health goals in hot water. 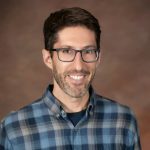 Whether it’s the candy in the vending machine, the french fries in the cafeteria line or the birthday cake in the conference room, it can be challenging for anyone to resist unhealthy food at work—and that, in turn, can affect health plan costs by increasing or exacerbating chronic conditions like diabetes and heart disease. A recent study by the Centers for Disease Control and Prevention (CDC) put a figure on, well, how food at work can impact our figures. Of the 5,000 people surveyed, those who obtained food at their place of employment, regardless of whether the food was free or paid for, consumed an average of nearly 1,300 extra calories a week. And it wasn’t because of a newly formed Kale Klub or Quinoa Clique. The leading food types were high-calorie snacks such as pizza, sugar-sweetened drinks, cookies, brownies, hamburgers, doughnuts and potato chips. But employers have an opportunity to influence employee eating habits, Onufrak said, with research showing that about one-third of all employees have access to a cafeteria at work and about one-half have access to vending machines. 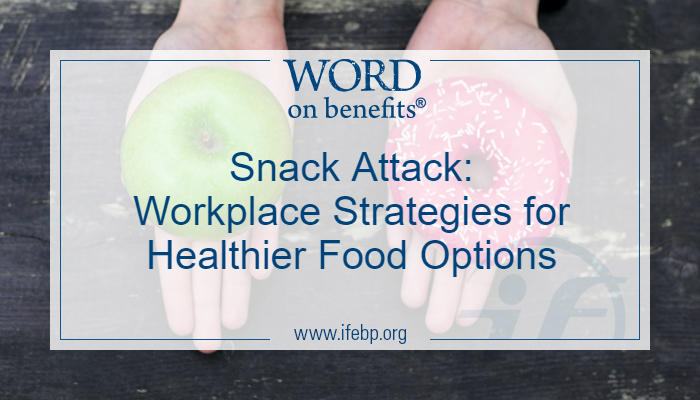 By making use of behavioral decision-making strategies, employers can encourage employees to choose healthier options. In other words, for some food for thought for workplaces surrounded by the constant thought of food, check out the following strategies by the U.S. Department of Health and Human Services in its Food Service Guidelines for Federal Facilities. Create flow paths in food service venues that emphasize healthier choices, place vegetables and other healthier food at eye level and/or provide a food service line that offers only healthier options. Offer options with smaller portion sizes, such as half-sandwiches and smaller beverage containers, or make healthier items the default options throughout the menu, such as fruit instead of chips. Offer healthier food and beverages at a lower price than less healthy items. Use smaller plates and bowls where employees self-serve to encourage appropriate portion sizes. Sugar-coated daydreams during late-day lulls can lead any of us astray, but employer wellness goals may be somewhat sated by the strategies mentioned above, along with a positive trend sprinkled on top: The International Foundation report Workplace Wellness Trends: 2017 Survey Results found that 49% of respondents already offer healthy food choices in their cafeterias or vending machines. Becoming more aware of the types and availability of food in the office is a step in the right direction. Implementing new strategies around food to help create a healthy workplace can be the icing on the cake.